I think it’s safe to assume that sleeping is a favorite hobby of everyone. Whether a good night’s sleep or a power nap, the benefits are endless. It’s something we literally can’t live without. But with over 50-70 million of US adults reportedly having some kind of sleep disorder, there’s a continuing need to find new ways to improve sleep issues. In recent years, technology has come to the rescue to help enhance and improve sleep in many different ways. One of the most interesting developments is how artificial intelligence (AI) is helping in the fight for a better night’s sleep. AI, in its broadest definition is any task performed by a computer or machine, which, if carried out by a human, we would say required a degree of intelligence. This obviously covers a wide range of applications, and indeed AI is ubiquitous today. AI tools and systems can be found embedded into software and computers everywhere. Common examples include Google voice search or Facebook automatically tagging you in photos. More advanced applications include self-driving cars, and medical computer systems that can help in diagnosing cancer. Many of today’s advances in AI have been made possible by what’s common called ‘big data’ – that is, using extremely large data sets which can be analysed to reveal patterns, and trends which relate to human behaviour. In the world of sleep technology, big data sets are often generated by sensors that are embedded into apps and gadgets. These sensors can measure our sleep patterns based on various metrics including body movement, breathing patterns, heart rate and even brain activity. Sleep technology use these vast stores of users sleep data to train their software algorithms through a process known as machine learning, so that as the technology gets to know more aout your personal sleep habits, it’s able to make personalised recommendations on how you might be able to improve your sleep quality. We took a look at at four different areas in which AI is helping consumers to improve their sleep. AI for babies may seem like an odd concept, but it’s helping many parents create positive sleeping habits and schedules for their little ones sooner than expected. Different baby monitors offer different features, but Nanit is a product that covers most, if not all, of the baby monitoring bases. With a camera that has a bird’s eye view of a crib, Nanit can track your baby’s movement, sleeping and crying patterns as well as environmental conditions such as light, temperature and humidity. The Nanit system provides smart notifications and alerts but can also help improve your baby’s sleep by learning from the your little one’s sleeping habits and preferences and providing personalized sleep coaching. To accomplish this, Nanit uses computer vision to capture video footage of your baby and analyzes the sequences using custom algorithms to provide relevant information back to parents about their baby’s sleep. There are literally millions of apps available to download for Android and Apple smartphones, so you won’t be surprised to find that there are lots of apps dedicated to helping you get a good night’s sleep. Many of the sleep apps utilize AI and machine learning algorithms to better understand your sleep problems and offer solutions to improve your slumber. SleepScore is an app that uses the microphone and speaker on your smartphone to track your breathing rate and movement during the night. It monitors how much you sleep you get within each stage of the different sleep cycles, including light sleep, deep sleep, REM sleep, how long it took you to fall asleep, your wake time, and overall sleep duration. Once you’ve recorded a few night’s sleep, the app uses big data analytics to compare your sleep performance to a typical person that fits your demographic profile, and gives you a ‘sleep score’ based on your data. It can then offer you personalised sleep coaching, specific tips on how to improve your sleep, and even produce a report that you can take to your doctor. A smart mattress is another option. Different models of smart mattresses do different things, so make sure to do your research if this is something you’re interested in. Generally, the concept behind a smart mattress is to record your sleep patterns. HEKA, a product that was recently announced, is said to be the first fully AI-powered mattress. 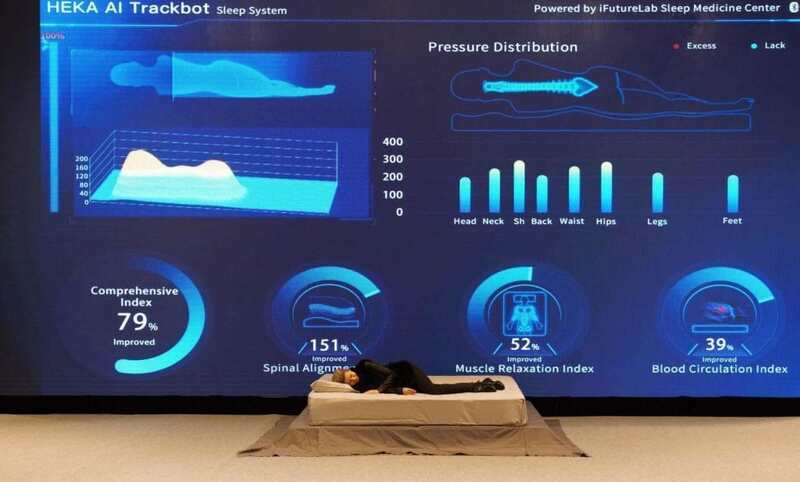 It has the ability to collect data on a person’s body pressure distribution, as well as body shape and sleeping positions, to then determine the best pressure distribution for the individual’s sleeping positions. based on other data collected through sleep medicine. It sounds like a crazy concept, but as you move the bed will essentially adjust to those movements, and create an overall better night’s sleep. Music has been scientifically proven to affect our sleep and for thousands of years, lullabies have been used to sooth babies and help them fall asleep. In order to understand what made an effective lullaby, healthcare company AXA PPP created two lullabies, one created by artificial intelligence, and the other by a human composer. After being shown sheet music in a computer-readable format, through deep learning, the software algorithm could get feel for harmony and rhythm, which led to the new composition. AI created the sheet music, and the music was then translated into a song with the help of a human. “We think AI is at its best when computers and people work together’,” said Ed Newton Rex, the founder of the company Jukebox, whose system was used by AXA to create the tune. Artificial intelligence isn’t going away. The ‘rise of the robots’ is only predicted to increase over the coming years. However, for people with sleep issues, this may come as a welcome relief. Whilst there’s no substitute (yet!) for the advice of a qualified health professional, it’s hoped that in the future, AI, machine learning and big data will be able to fill in the gaps for many sleep-related health tasks including diagnosis, treatment and ongoing therapy for a range of sleep disorders. Plus, in the future, there will no doubt be many more sleep gadgets and apps like the ones we’ve described here, enabling everyone to benefit from the advanced learning capabilities of artificial intelligence. Sara is an experienced tech expert who writes on her site Enlightened Digital, to share her passion with others around the web. After 15 years in the industry, her goal is to bring information on all technology to the masses. Her philosophy is to create each article so that anyone can understand the content, whether a consumer or a tech expert. Check out her site at Enlightened-Digital.com. Do you love to hear about the latest cutting edge sleep products? Just enter your email below to stay in the loop. We promise you, no spam!